Christmas shoppers are being encouraged to buy a little something extra this year and donate it to an annual stocking appeal. For the last six years, colleagues at Caring Lady Funeral Directors have been putting smiles on children’s faces as they deliver Christmas stockings to Chestnut Tree House Hospice. After December 20, the donations from all of the six branches in Brighton, Goring by Sea, Hove, Peacehaven, Shoreham by Sea and Worthing will be hand delivered to the hospice ready for the children on Christmas Day. Clare Taylor, Funeral Co-ordinator at Shoreham’s Caring Lady Funeral Directors, said: “Last year myself and my daughter delivered the presents to Chestnut Tree House. They are always surprised and taken aback by the generosity of the local community. 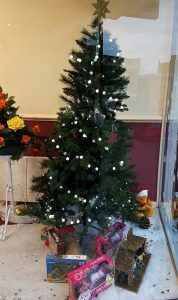 “The Shoreham community is very generous when it comes to the children’s hospice and the window display is beautiful with all the presents under the tree. It is certainly eye-catching. The Caring Lady Funeral Directors are inviting people to make gifts suitable for children which can fit in a stocking. Donations can be made from Friday 30 November until 20 December. Chestnut Tree House is the children’s hospice for East and West Sussex, Brighton and Hove and South East Hampshire and cares for 300 children and young adults from 0-19 years of age with progressive life-shortening conditions.